The first 150 years were not so bad. On Nov. 25, 1758 British Gen. John Forbes named the city for prime minister William Pitt after chasing the French from the militarily and economically strategic triangle of land where the Allegheny and Monongahela rivers meet to form the Ohio. Historically, we started off on a roll, thanks to our strategic location on the rivers, North America’s first oil and gas boom, and lots of coal. By 1909, when social scientist Paul Kellogg cataloged the city’s industrial might in "The Pittsburgh Survey,” he said it was not just "first among American cities in the production of iron and steel" but also "first in electrical apparatus and supplies." “In coal and coke, tin plate, glass, cork, and sheet metal ... its output is a national asset," Kellogg wrote, adding that Pittsburgh's banking capital exceeded "that of the banks of the North Sea empires and its payroll that of whole groups of American states." "Here," Kellogg claimed without exaggeration, "is a town, then, big with its works." Unfortunately, that world famous powerhouse of iron and steel is long gone. Today the Pittsburgh region’s de-industrialized economy runs mainly on providing health care for its aging populace, the education of about 140,000 college students and the construction of taxpayer-subsidized professional sports stadia and mass-transit boondoggles. In her 1969 book The Economy of Cities, Jane Jacobs traced the origins of Pittsburgh’s economic downturn all the way back to 1910. But its demise, she claimed, was abetted and accelerated after World War II by its downtown political and corporate powerbrokers. These are the direct ancestors of the civic movers-and-shapers, government redevelopment planners and political hacks who have been mismanaging our city so horribly for the last 20 years. The post-WW II power elites cleaned up Pittsburgh’s poisoned three rivers and Venutian atmosphere, but Jacobs said they also worked overtime to protect incumbent steel and manufacturing industries and discourage new industries from being born. They also launched misbegotten urban renewal projects in three poor and/or black neighborhoods – the Hill District, East Liberty and the North Side – whose destructive effects still afflict the city. As most Americans know, having its biggest economic eggs in heavy manufacturing turned out not to be such a good long-term plan for Pittsburgh when the steel industry collapsed in the 1970s and 1980s. Its metropolitan population went into its nationally famous free-fall. In 1960, there were 2.4 million people in metro Pittsburgh and 604,000 in the city of Pittsburgh. Metro Pittsburgh was the 12th biggest TV market in the USA. Today, Pittsburgh metro has a population of 2.3 million and – incredibly – there are just 310,000 souls left in a city that peaked in 1950 with 676,000 people. Metropolitan Pittsburgh is ranked 26th today. As its population has shrunk, the region has emulated the demographics of Western Europe and Russia. Its population is disproportionately old (24 percent are 65 or older, about twice the national average) and since 1990 more Pittsburghers have died each year than have been born – a net loss of 25,000 people since 2000 alone. It also has fewer foreign-born immigrants (about 3 percent) than any major American metro area. This is all the more the shame since the city boasts many priceless assets. These include a relatively low crime rate, great old middle-class city neighborhoods, affordable suburban homes in good school districts, top universities like Carnegie-Mellon and Pitt, major league sports teams, big-time cultural attractions and a beautiful landscape of hills, hollows and wide rivers. These assets are one reason why “Places Rated Almanac” crowned it the country’s most livable city in 1985 and again last year. In 1985 The New York Times immediately dispatched a reporter to Pittsburgh to check out the claim and he wrote back that "With its breathtaking skyline, its scenic waterfront, its cozily vibrant downtown, its rich mixture of cultural amenities, its warm neighborhoods and its scrubbed-clean skies, it no longer is the smoky, smelly, gritty mill town of yesteryear." Pittsburgh – which, for the record, hadn’t been “The Smoky City” since about 1950 – is re-discovered by the bicoastal media every few years. Brendan Gill of the New Yorker came here in 1990 and famously raved about the beautiful terrain, the old architecture and ethnic neighborhoods and said if it were a European city people would travel hundreds of miles out of their way to visit it. When it comes to pop culture and new retail chain outlets, Pittsburgh’s at least 5 years behind L.A. or San Francisco, which isn’t necessarily a bad thing. Pittsburgh remains a fine city in which to raise a family, grow old and die. What travel writers never seem to notice when they parachute into town however, is the chronically sorry state of Pittsburgh’s public sector. A one-party (Democrat) town since 1934, the city of Pittsburgh has been run like Argentina ever since. Over-taxed, over-regulated, over-planned, quick to abuse its eminent domain powers, it’s now virtually bankrupt. Its finances are now overseen by the state. Its budget flirts with red ink each year. On the horizon loom huge pension liabilities that it can’t possibly pay. City Hall can barely provide a decent level of basic services. Meanwhile, they find money to subsidize downtown retailers who often go bust and leave. The city’s redevelopment gurus have handed out tens of millions of taxpayers' cash to private businesses. The most recent example was giving PNC Financial $48 million in public subsidies to build its new and superfluous skyscraper downtown where vacancy rates, pre-recession, stood well in the double digits. Pittsburgh’s public school district is equally inept and even more expensive. It spends well over $20,000 a year per student while enrollment – nearly 40,000 in 1998 – is down to 26,600 and falling. The graduation rate is 64 percent, according to a recent Rand Corp. study. Local school and property taxes are among the highest in the country. The region’s roads and parkways are in bad shape – can you spell p-o-t-h-o-l-e? – and designed for 1950s traffic counts. 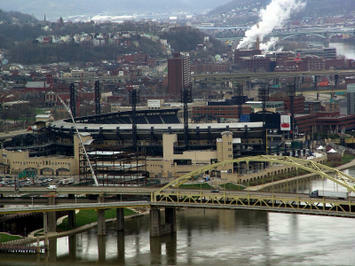 The city of Pittsburgh’s parking tax could be the highest on Earth – 40 percent. City firefighters have some of the highest public salaries in town – and trade their votes for sweetheart contracts. The poster child for mismanaged government bodies, however, is Pittsburgh’s public transit monopoly, the Port Authority of Allegheny County. For the last 20 years, as its ridership has fallen steadily and its annual budget has hit $350 million, it consistently enriched its union workers and managers with high salaries, super-generous benefits and pensions. Port Authority budgets have outpaced inflation since 1980 and with fares covering about a third of operating costs, it has had to ask for higher and higher subsidies from the state to keep its mostly empty buses lumbering around town. Since the late 1970s, it has spent upwards of $2 billion (in current dollars) on three dedicated busways and a rinky-dink light-rail system that serves about 12,500 suburban round-trip commuters a day. The transit agency’s proudest boondoggle, however, is the North Shore Connector, aka “The Transit Tunnel to Nowhere.” Arguably the premier transit boondoggle in North America today, it’ll cost $435 million (a low-balled figure that hasn’t been adjusted to reflect reality in several years) for a 1.2-mile twin light-rail transit tunnel under the Allegheny River from Downtown to the taxpayer-subsidized pro sports stadiums and not far from the new casino. The tunnel’s construction currently is tearing up a huge chunk of the North Shore between PNC Park and Heinz Field. It is projected (most dubiously, of course) to carry 16,000 passengers a day – by 2030. A local think tank, the Allegheny Institute, worked out the per-trip subsidy to be $15.50. Set to be completed in 2011, it will be a miracle if the project comes in under $600 million. Today Pittsburgh’s regional economy is what it’s been for the last 40 years – stagnant at best. Yet perversely, but predictably, its civic boosters are trying to sell the anemic economy as something to be thankful for because it is "recession-proof." Since Pittsburgh never had a housing bubble, the spin goes, the foreclosure crisis will hardly affect it. Because Pittsburgh has all those extra citizens on Social Security, the economic meltdown will be less severe. Maybe becoming a morgue might be even safer. Yet somehow the local spinmeisters continue to put a bright spin on Pittsburgh’s century-long death spiral. For example, USA Today recently cranked out a big upbeat feature on how wonderful Pittsburgh is – without mentioning such unseemly things as high taxes, bankruptcies or out-of-control government agencies. What the Plain Dealer never bothered to note, of course, was that the office tower, the pricy condos and the hockey arena were not being built in downtown Pittsburgh because they actually made economic sense. They were being built only because local politicians had handed millions of dollars in public subsidies to their private, well-connected owners. If this is the road to an urban renaissance, it’s certainly an expensive one. Most likely, it will prove the path to yet another dead end. Bill Steigerwald, born and raised in Pittsburgh, is a former L.A. Times copy editor and free-lancer who also worked as a docudrama researcher for CBS-TV in Hollywood before becoming an associate editor and columnist for the Pittsburgh Tribune-Review. Submitted by uofix on Tue, 09/16/2014 - 08:05. Submitted by towxa1122 on Tue, 09/09/2014 - 06:51. Submitted by uofix on Wed, 09/03/2014 - 06:20. Submitted by MaxMerry on Mon, 05/26/2014 - 08:36. This place have been very close to my heart specially because of the kind of arrangement it have for the casino lovers. This place was once famous for the enormous amount of joy it showered for everyone around. Perhaps the most lively city around I have been in this city for a number of times and each time I visit them they surprise me with something new. Looking forward for the next surprise. Submitted by andrya on Mon, 12/16/2013 - 03:28. I have seen many who say they will train your employees for that, but i am looking to subscribe to someone who will manage the SEO Services Provider for my website. What kind of prices does one pay for such services? Submitted by andrya on Sat, 08/17/2013 - 00:23. Submitted by Britowhite on Wed, 07/02/2014 - 05:50.